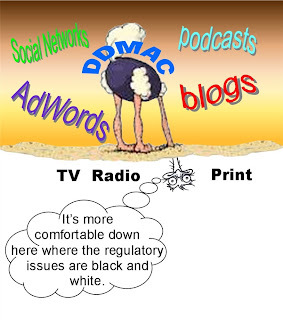 Pharma Marketing Blog: Where's DDMAC's Head At? How is DDMAC likely to regulate pharmaceutical promotion via blogs? Since I was on the panel to which this question was directed, I took a stab at answering it. "The image that comes to my mind," I said, "is an ostrich with its head in a hole in the ground." Actually, I said "big bird," but everyone knew what I meant. Another audience member agreed, but said he had different hole in mind. It was an interesting image to end the session with. The saga of the FDA vs. the Internet goes back at least ten years -- to October 16 & 17, 1996 -- when the FDA hosted its first ever (and maybe last ever) public hearing on the Internet. The purpose of this 2-day gathering was to help FDA evaluate how "the statutory provisions, regulations, and policies concerning advertising and labeling should be applied to product-related information on the Internet and whether any additional regulations, policies, or guidances are needed." I guess the FDA decided there were no additional "regulations, policies, or guidances" needed because it has been mostly silent on the issue all these many years. In attendance at that seminal FDA meeting were many of the people directly responsible for creating the "Medical Internet." I participated on the Web Links Panel, which included representatives from the pharmaceutical industry, advertising and marketing industry, medical associations and publishers, patient advocacy groups, other government agencies like the Federal Trade Association (FTC), physicians, web site developers, etc. All you "newbies," which I define as anyone who began using the Internet for marketing AFTER 2000, should read the minutes of that meeting. You might just learn something! The FDA, like the industry it regulates, focuses 94% of its attention to broadcast (mostly TV) and print communications, even while these media channels are losing ground to the Internet in terms of reach. This was made evident to me from data reported in a recent Government Accounting Office (GAO) report to Congress: "Prescription Drugs - Improvements Needed in FDA's Oversight of Direct-to-Consumer Advertising." You can access the report here. In the report, the GAO claims the FDA "lacks an effective way to screen, review and track the more than 10,000 ads and Web sites brought to the agency's attention each year" (see "Group Wants FDA to Review More Drug Ads," NYT, 12/14/2006). There is some revealing data in the GAO report that illustrates where DDMAC's head is at. First, the FDA reviews every DTC TV ad it receives, regardless of the merit of the claim against it. The GAO states: "FDA officials told us that they review all final and draft DTC television advertisements that FDA receives because these materials are likely to be widely disseminated to consumers." While TV does have incredible reach among consumers, so does the Internet. Forgive me for not getting into all the numbers in defense of that statement. Go ask Jack Barrette at Yahoo! for his slide deck. NOTE: Also take a look at today's post to Eye On FDA where you can find links to numbers (see "New Media and YOU"). The FDA should be taking a closer look at drug promotion via the Internet because there seems to be a wild-wild West scenario playing out right now with many companies pushing the envelope and using ad techniques that a majority of experts consider violative of FDA regulations (see, for example, "The Girl From Google" and "Celebrex Joins the bAdWord Bandwagon!"). Take a look at the following chart, which shows the number of final DTC and "consumer-directed" (eg, patient brochures distributed by physicians) materials submitted to the FDA from 1999 through 2005. The data is from the GAO report. I replotted it to better demonstrate the trends. The red "DTC" line excludes the Internet, which is shown by the blue line. 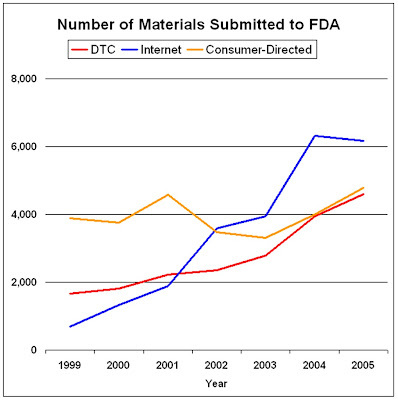 The main trend I think this chart shows is that while there has been an across-the-board increase in all types of materials submitted to the FDA for review, the number of Internet materials is increasing fastest, at least up until 2004. Obviously, there is a lot of Rx promotion via the Internet and DDMAC should not keep its head in the broadcast/print sand and continue to ignore what's happening in the real world. In the future, the drug industry will bombard the FDA with lots more TV-based materials for review prior to airing (see "Pay Per DTC Ad View Update"). If the FDA continues to give these priority -- and it will because the industry will pay the FDA to do it! -- then advertising on the Internet will continue to fly under its radar for a long time to come (unless Congress prohibits DTC altogether -- not likely, in my book). The GAO report also documents that prior to 2002 it took the FDA just 2 weeks on average to issue warning letters about violative Rx promotions, whereas today it takes 4 months. This is due, claims GAO, to the additional resources needed for these letters to pass legal review within FDA. HHS defended the review process because it increases compliance by the drug industry. If the FDA depends upon voluntary compliance, then it makes sense for the industry to develop its own voluntary guideline for Internet advertising just as it did for broadcast and print. This way, if and when DDMAC gets its head out the ground or wherever else it may be, the industry won't be hit with the "teeth" of enforcement. I'm guilty! I confess to being that audience participant who offered the notion that the FDA's ability to regulate drug promtion via blogs was much akin to the FDA having it's head up its posterior. And with good reason. My reason for attending the Web Blogging Summit was to learn the status of healthcare web blogs. From what little I've seen, they are beginning to gain traction, albeit slowly. The rest of the professional healthcare advertising, communications and promotional community is now getting an inkling that blogging may not just be a passing fad, but is, in fact, an integral part of the Internet 2.0 arena. We heard real examples of that at the Summit. One thing that is clear from over 20 years of my work with the Washington healthcare arena, is that FDA is a slooowwww adopter. John mentioned FDA's focus on traditional paper and airwave advertising. This parochial approach is mired in years of antiquated thinking and plodding views of what can and ought to be current. For an agency charted with directing the future of innovative technologies, the FDA's ability to understand the technology of communication is baffling. We all share the fear that when FDA finally awakens to the 21st century's newest modes of communicating messages - through various iterations of Internet 2.0 methodologies - its response may be tough, reactionary, even draconian. And that would have us all pray that the regulators in Rockville, MD quickly bury their heads back in a dark place. I am sorry that I didn't get a chance to speak with you more at the conference. Drop me an email at johnmack@virsci.com and tell me more about what you do.